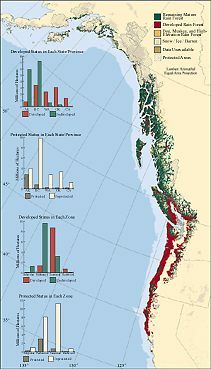 Current status of the coastal temperate rain forest: Forty-four percent (in red) has been developed; the remaining mature rain forest (in green) is mostly north of Vancouver Island. The coastal temperate rain forests of North America occupy a place of central importance in the global future of this forest type. Originally covering some 25 million hectares, the narrow band of coastal forests between Alaska and northern California equaled in area all other stands of coastal temperate rain forest combined. These rain forests have sustained human communities for at least five millennia, longer than western redcedar has dominated the forests themselves. In many obvious ways, and probably in ways yet undiscovered, the thin band of coastal forest interlaced with ocean is utterly unlike the far more extensive interior forests that begin just a few hundred kilometers inland. It is more luxuriant: abundant rainfall and a nearly snow-free climate provide for rapid tree growth while frequent fog sustains a heavy and diverse crop of mosses and lichens in the forest canopy. Large-scale fires are less frequent than in most other temperate forest types and less probable than in other conifer forests. Intricate networks of streams, wetlands, and estuaries lace through coastal rain forest watersheds, creating habitats for freshwater and anadromous fish, for wildlife dependent on aquatic habitats, and for plants adapted to wet conditions. These riparian habitats create natural corridors for animal movement, and the streams that shape them distribute nutrients throughout the landscape. The unique plant and animal communities found both above and below ground in riparian zones contribute elements of biodiversity found only in coastal forests. North America's coastal rain forests contain more than 30 tree species and about 250 species of birds and mammals. The diversity in these groups, though not exceptional by global standards, includes species that better embody the interdependence of land and sea than perhaps any others. No living things demonstrate more dramatically the reciprocity of forest and sea than the seven species of Pacific salmon and trout that range widely in the North Pacific while they grow to maturity, then return to their natal coastal rain forest streams to spawn. Supported by this fecund bioregion were First Nations settlements with among the highest densities of peoples found anywhere on the North American continent, totaling several hundred thousand. More than sixty distinct languages embodied a linguistic diversity far greater than that of the continental interior, surely a reflection of the ecological complexity of the sustaining coastal lands and waters. Only in a few other places in the world did comparably advanced societies arise on a foundation of natural abundance, rather than farming or herding. Today forty four of the sixty eight language groups believed to have been spoken at the time of the European exploration are extinct or spoken by fewer than ten individuals.